It was the last "recreation" day of our two-week trip to the Sierras. We had done some sport climbing in Toulomne on the Circle A Rock in the morning, had another fantastic meal at the Lee Vining Mobil station and had driven the three hours from Lee Vining to the Boundary Peak trailhead on the east side of Boundary Peak. 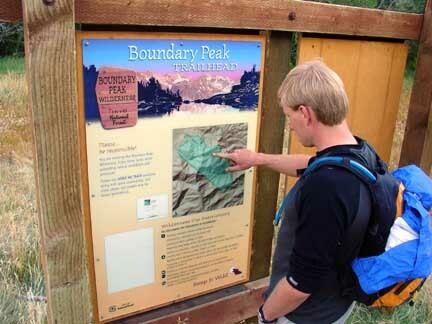 Actually getting to the trailhead for Boundary Peak is more difficult and time consuming than the actual hike. The 14.5 mile dirt road to the trailhead is not obviously signed for Boundary Peak and is instead signed for Trail Canyon. It seems there is often much confusion and discussion about finding the proper road to the trailhead. Just look for the good dirt road signed "Trail Canyon" on a brown sign 17.7 miles north of Dyer, NV on highway 264. We also used some very detailed driving directions from MuellerWorld which helped confirm we were actually on the right road. The road itself is a decent dirt road but was a little rough for Bill's Honda Civic CX hatchback. But he managed to get us to within a half mile of the trailhead in about an hour of dirt road driving. After driving as far as we would drive, we parked the car along the side of the dirt road around 4:45pm. With a nearly full moon in the forecast, we opted to start the hike right then instead of hiking the next day. The evening was beautiful and the temperature good so we packed our light packs and started hiking at 5:15pm. The information we had about the hike wasn't very good so we weren't quite sure how much distance and elevation gain we would need to do but it didn't look like too much. We estimated 4 miles up and about 4,000 feet of elevation gain. My altimeter watch was reading 8,800' and we knew the summit was at 13,140'. We hiked the road the rest of the way to the true trailhead where we found a nice sign for Boundary Peak--the first and only sign that actually confirmed for us that we were in the right place. Bill scopes out the trailhead sign and map. To our surprise the hike was going to be much shorter than we had guessed. The sign had a small map on it showing the way and we could nearly see the summit of Boundary Peak from this vantage so we could get a read on our planned route. So we continued. The trail is good but not as good as one might expect for a state highpoint. We followed a small spring-fed stream for about a mile while occasionally passing through neat bushy tunnels before getting out into the open sagebrush territory. Hiking this trail reminded me of hiking in northern New Mexico because of all the familiar vegetation and similar looking terrain. Cows apparently spend a lot of time along this stream and we encountered a number of places where cows had spent some time. There were also large piles of horse or mule poop in places. Interesting. At a couple of sections, spring water flowed down the trail making for squishy hiking but with some decent rock hopping skills, we could avoid getting our feet wet. We saw a couple small groups of deer in the valley as well. The sun was falling behind the ridge that we were heading towards. Bill and I wanted to be on top of the ~12,200' ridge before sunset so we pushed hard. However, the trail soon became a loose, steep situation were one step forward meant sliding back a bit each time. It wasn't great but it would mean a quick descent! 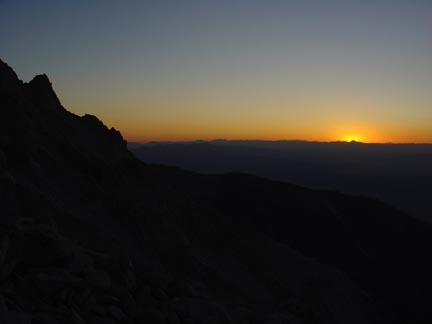 We managed to arrive on top of the ridge at 6:58pm, just before sunset and had a great view of the Mount Whitney massif to the west and the awesome, lonesome valley to the east. Arriving at the saddle just before sunset. A beautiful evening with great light. The breeze was a bit more substantial on the ridge but really not much of anything. We did put on another layer and our gloves before continuing up along the ridge towards the summit. From here we could see the rest of the ridge and the summit and our goal wasn't far away. Sunset over the Sierra Nevada Mountains. Now being on the ridge, the going was much easier with a fair bit of boulder hopping and obvious trail. We hiked along the ridge's east side for a short bit before moving over to the west side and then on top of the ridge proper to the summit. 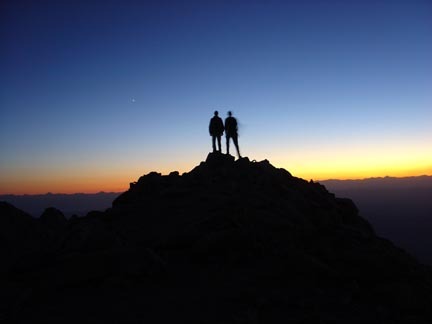 We reached the summit just after 7:30pm with enough fading sunset light to make for some cool views and photos. The nearly full moon had already risen so the east side of the range was illuminated by moonlight while the west side of the range still managed a very faint orange glow from the sun. The air was mostly still with a slight chill but it was very pleasant. I was in awe at the nearly complete lack of man-made light sources all around. I think I counted two single lights on the west side and eight single lights on the north and east side of the peak. I commented on how we could see more man-made light sources from Kilimanjaro in East Africa than I could see from here, the highest point in Nevada. It's definitely some desolate country in western Nevada/eastern California! We snacked a bit and signed the register that was contained in the ammo box. The register was a spiral-bound notebook left by someone that had plenty of blank pages left in it. Some folks had written nearly a page's worth of stuff at a time! It appeared there had been two other parties on the summit this day which amazed me given the isolation we felt during the drive in and from looking around from the summit. Alas, it was chilly and we still had some hiking to do before setting up camp so we started down at 8pm under the bright moonlight. Descending the ridge went smoothly and soon we were back at the small saddle looking down the steep, loose trail. I wasn't looking forward to it but it turned out to be mostly pleasant and quick efficient. Each step down meant a small slide down loose dirt and gravel which was easy on the knees and effort. Certainly we weren't easy on the environment with such a trail. 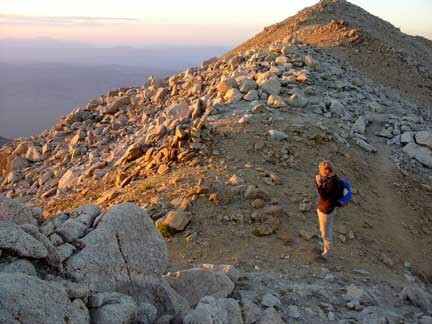 I hope the NTI (Nevada Thirteener Initiative) can get to working on the Boundary Peak trail soon. Although I'm sure the NTI is busy with all the other thirteeners in Nevada at the moment. Scree gaiter would be very helpful on this trail as we had to stop at the bottom of the steep, loose section to empty our shoes out. Once down the loose stuff, it was fast cruising on the good trail back down into the valley and along the stream back to the trailhead. The light of the moon coupled with the light of our headlamps made the going fast and easy and by 9:30pm, we were back at the car. It was a very pleasant night hike of Boundary Peak. It was nice to hike this peak at night to avoid the daytime heat and to see the sunset from so high above the surrounding plains. The nearly complete lack of man-made light sources in the surrounding area really impressed me. Written by Jason Halladay on 16 September 2005.